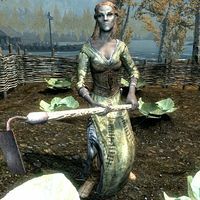 Synda Llanith is a Dunmer farmer who works and lives at Merryfair Farm with her husband Dravin. She believes in honest pay for honest work and will pay you for harvested wheat, cabbage, and gourd. She rises early at 5am and always starts the day with a one-hour breakfast. She then heads outside and works the farm all day long, interrupted only by a one-hour dinner at 6pm. At 11pm she heads back inside and goes to bed. She wears farm clothes and boots and wields a leveled dagger (up to elven quality at level 20). She carries a belted tunic and a selection of common items and gold. The remote farmhouse was recently robbed and her husband's precious family heirloom was stolen. When approached while she is working in the field, she will explain: "After we were robbed, Dravin's become more bitter than ever. He hates this place." and "I'm afraid we have little to offer you in the way of hospitality." If approached when she is inside the house, she will add: "You'll have to forgive my husband's manners. He's not used to pleasantries." and "The war's been hard on the farm and hard on Dravin. We don't know what to expect from one day to the next." 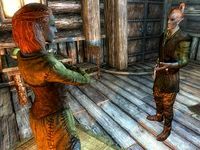 She will also admit she misses her native Morrowind: "Someday, I hope we can get away from here... perhaps move back to Morrowind. This isn't at all what we expected." After you complete her husband's quest she admits: "Now that you've brought Dravin's bow back, he's back to his crabby old self. For better or for worse, I still thank you." Dravin: "That doesn't matter. All it would take is a stray wolf or a bandit crossing your path... I can't bare to lose you after everything we've done." Esta página foi modificada pela última vez à(s) 23h36min de 18 de setembro de 2013.